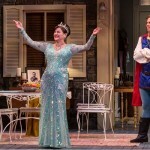 Chicago Theater Reviews | Reviews of Chicago Shows and more! ‘The Last Ship’ By Sting Sails Through Chicago! As I watched Sting perform a song on the Tony’s from his new musical The Last Ship, I couldn’t quite get in emotional touch with the show. The song was beautifully written, beautifully sung, but only gave a clue into what this show could be. And rightfully so. 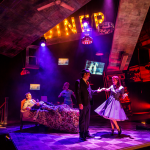 The Last Ship (currently playing at The Bank of America Theatre in Chicago) is the deeply layered, moving and funny journey of one man, one woman, one town and much passion through the streets and a shipyard in Wallsend, England. The term “layered” is the word that floated through my mind throughout this stunning show. The layers of the relationship between one man, one woman and another man. The layers of love between a father, his son and then his son. The layers of movement that slowly built across the stage, both by the cast, the lighting and the sets. The layers of the music that slowly built upon the last note until you found yourself engulfed by the wonder of it. The many, many layers. And at the same time, the sets are plain. There is no money in this town. The costumes are nothing but appropriate for the period and the weight of the emotional toll that has been taken. The many, many layers. Sting’s music and lyrics for The Last Ship bring you fully into a world of sadness, dedication, love and loyalty. There were many, many songs that clearly touched both myself and the audience, but two of those standouts were “Dead Man’s Boots” and “Ghost Story.” While you deeply care what happens to the people in this town, it is the story of the fathers and the sons that touches your heart in ways that are both new and familiar. They are relatable, painful and absolutely beautiful. The one slightly off number was “If You Ever See Me Talking To A Sailor,” sung by the women of the town. While the voices were powerful, the acting was on point and the rhythm of the scene was there, it lacked the feeling, depth and fun that was captured in the rest of the show. To be clear, while this number worked well in so many capacities, it wasn’t at the level of breathtaking. And once you’ve touched that as an audience member, you’ll accept nothing less. The Last Ship is a production that you need to add to your theatre schedule. It is a show that will hold you until the last second and send you off into the sea. The Last Ship will fill your soul, break your heart and leave you wanting more. 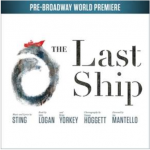 The Last Ship by Sting Pre-Broadway World Premiere Review – The Last Ship is playing at The Bank Of America Theatre between 6/10-7/13. Tickets can be purchased through the Broadway In Chicago site and Ticketmaster online. The Bank Of America Theatre is located at 18 West Monroe in Chicago. 'The Last Ship' By Sting Sails Through Chicago! 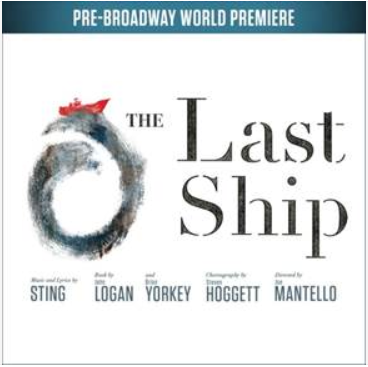 'The Last Ship' by Sting has come to Chicago during it's Pre-Broadway Premiere! Read this review and check your calendars! You don't want to miss this! The Last Ship Chicago Discount! WOW! 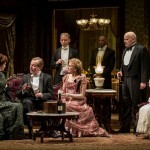 Your review has certainly whetted my appetite to see what sounds like a fantastic show. I will be calling to order my tickets for The Last Ship tomorrow.